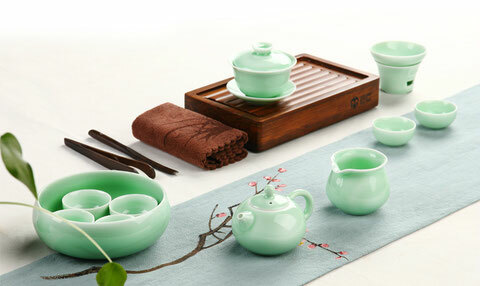 Celadon is a high-temperature color glazed porcelain with iron as its coloration. Porcelain we used today all develops from celadon. 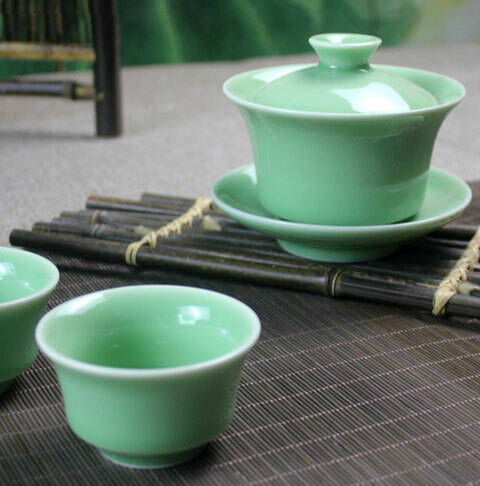 Since celadon teaware looks fresh and green and contributes to the look of tea, it is always welcomed by people in different times. 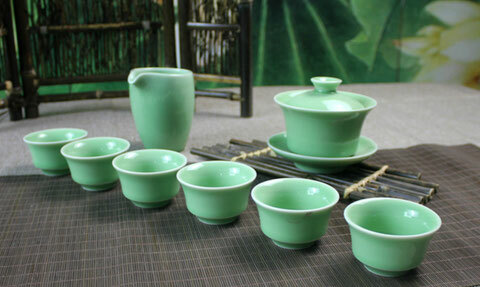 In the Tang Dynasty, the glaze of celadon from Yue Kiln looked similar to jade, which had slight yellow with dark green. Celadon then was fashionable for a time and considered an ‘aristocrat in porcelain’. 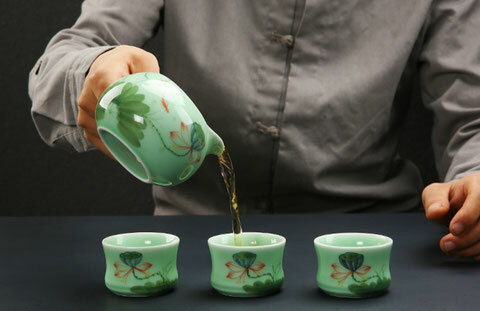 In the Song Dynasty, as one of the five famous kiln at that time, Longquan Kiln in Zhejiang Province produced celadon tea sets which reached a peak and sold throughout the country. 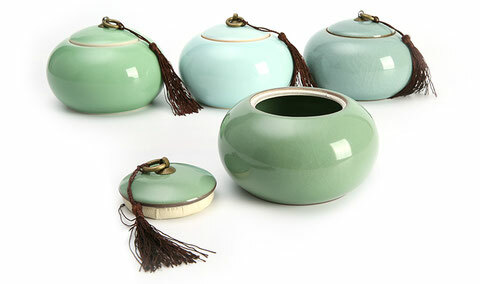 Craftsmen from Longquan Kiln made 2 selected porcelain, pale blue and plum green. Pale blue and plum green glaze had a large sum of bubble and unmalting quartz particles. When light shone on the glaze, it would show a color soft as jade and green like plum. 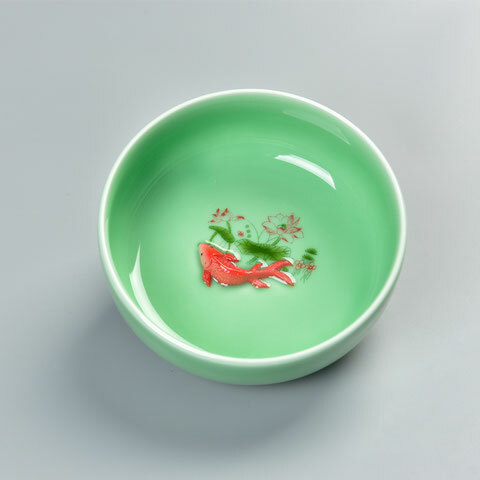 This effect helped celadon from Longquan Kiln reach an extremely high position in art. 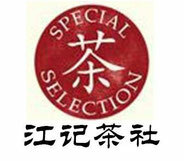 At the last stage of the Southern Song Dynasty, Longquan Kiln stopped its production for a while. However, in the Yuan Dynasty, not only the production of celadon from Longquan Kiln was recovered, but also the unconstrained and heroic style of Mongolian people was also integrated into the porcelain making. The base of this celadon was very deep and thick and the color of the glaze became mature and dignified. In the Ming Dynasty, celadon from Longquan Kiln shared both the features of vigor and elegance, which came to a new level in art skills. In the last 16th century, celadon from Longquan Kiln was exported to France and made a big hit there. At that time, French people compared it to Celadon, the heroine of a French opera, and took it as rare treasure.